Wednesday July 13th 1892 I took an early start to the valley this morning. I took Edith with me. There were a number of us invited to Stevens. we had a very pleasant time. It was very hot going down but turned cooler by the time we came home. Will finished plowing today. Thursday July 14th 1892 Leonard helped me wash this forenoon. We were only an hour doing it. Hattie was over and Mother went home with her. I was working about nearly all day as I did some ironing and some work in the yard. The men were busy with the hay. Friday July 15th 1892 We were busy with the work all forenoon as there was churning and baking to do. I wrote a couple of letters after dinner and went to town to mail them by way of Collins to see about the carpet. was down to Hatties awhile. When I got home found Lizzie Lindley had been here. I worked late in the evening. The men had put in a big day in the hay field. 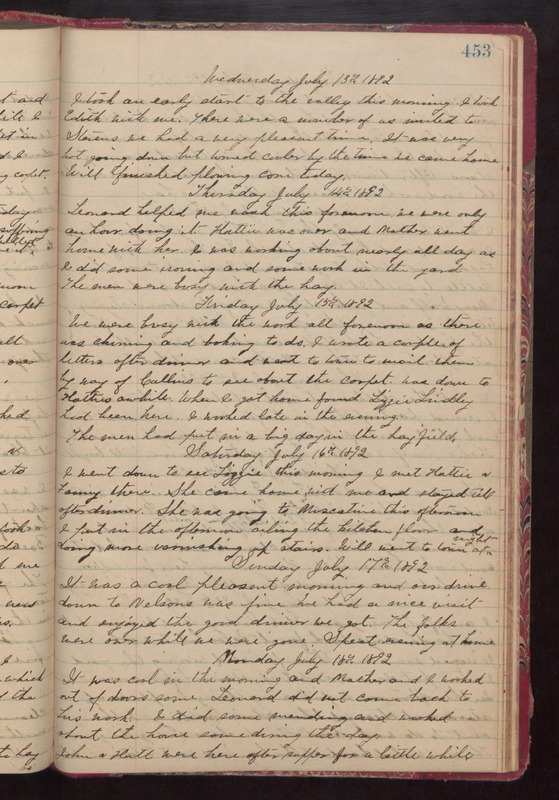 Saturday July 16th 1892 I went down to see Lizzie this morning. I met Hattie & Fanny there. She came home with me and stayed till after dinner. She was going to Muscatine this afternoon. I put in the afternoon oiling the kitchen floor and doing some varnishing up stairs. Will went to town at night. Sunday July 17th 1892 It was cool pleasant morning and our drive done to Nelsons was fine. We had a nice visit and enjoyed the good dinner we got. The folks were over while we were gone. Spent evening at home. Monday July 18th 1892 It was cool in the morning and Mother and I worked out of doors some. Leonard did not come back to his work. I did some mending and worked about the house some during the day. John & Hattie were here after supper for a little while.